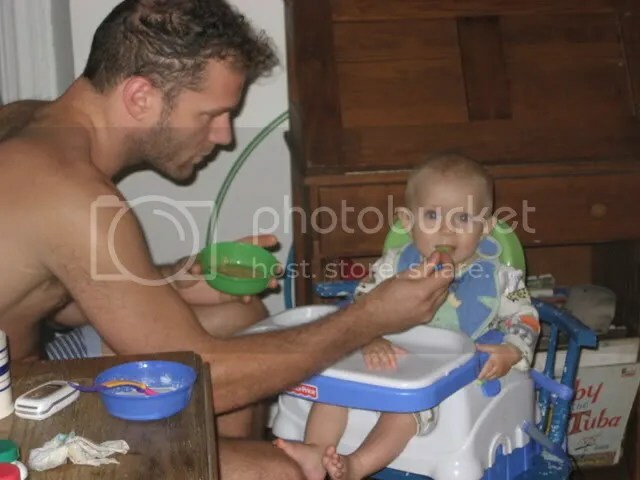 An old picture of Rafael and I during breakfast. He is eating Kids First Oatmeal blended with breast milk. He hadn’t realized he could take off his own bib yet. The white cover on top of his table is still on so he was probably not strong enough yet to rip that off (as he did later). Bottom right is an album of Tubby the Tuba. A terrific tale of a Tuba named Tubby who wants more from his life than the reciting of a simple bass line; dreams of having his own solo and though ridiculed and humiliated by his orchestra, runs away, meets a frog, learns the lesson of belief in self and the power of stealing your friends idea’s and improving on them, only to come back and wow the entire concert hall. My hair is also much longer now on the lower parts of my shoulder and back.